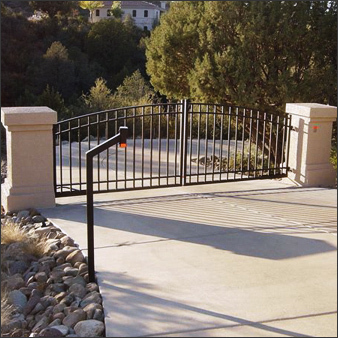 Estate Swing is one of the top selling DIY gate opener brands in America today. Estate Swing offers contractor-quality products with installation that is designed for the average homeowner. Estate Swing backs its professional grade openers and accessories with custom manuals, how-to videos and industry leading warranties. Estate Swing also works directly with manufacturers to improve product models utilizing feedback from the end user. Specialty brackets and built-in safety mechanisms are just two features that this brand is known for implementing. As a leader in innovations for the industry, the Estate Swing brand provides technologically advanced gate openers designed specifically with safety and a variety of customer needs in mind. We acknowledge that hi-tech advances increase the efficiency and usability of automatic gate opener devices, so we strive to offer products that feature the most recent developments. Estate Swing was proud to be the first U.S. brand to offer carriage door openers, wireless transmitter/receiver style photo eyes, articulating arm style automatic gate openers, and the GSM wireless cellular intercom. All of these innovative products offer convenience, as well as solutions to individual end user needs. Estate Swing has an exclusive partnership with several manufacturers throughout the world, obtaining the best technology from some of the top engineering minds. One partner that Estate Swing has had a long standing relationship with is FAAC. Since 1965 FAAC has been supplying solutions for automated systems for both residential and commercial applications. With sleek Italian design, FAAC uses quality materials and the latest technology in gate automation to develop systems that are efficient, long lasting and durable. By incorporating residential level FAAC openers into its diverse product line, Estate Swing is able to provide a selection of openers that meet a variety of consumer’s automation needs. Estate Swing with FAAC incorporated design brings to the market a collection of gate openers that exceed expectations and offer automation options to customers for standard and specialized applications. Estate Swing has brought these innovative designs in the United States through a variety of trusted distributors. Whether online at third-party authorized websites, offline at popular brick and mortar stores or through local installers, you'll find the Estate Swing brand across the nation and exported worldwide. Estate Swing works exclusively with ISO 9001 certified manufacturing companies. ISO 9001 certification is the internationally recognized standard in quality control and management.